PERI is one of the leading international companies in the formwork, scaffolding and engineering sector, and has an effective local presence through 70 subsidiaries in over 90 countries around the world. 8,700 employees generated a turnover of EUR 1,480 million in 2017. Central functions, development and production facilities are located in Weissenhorn near Ulm in Southern Germany since the founding of the company in 1969. PERI provides building companies and scaffolding contractors of every size the best solution for efficiently realizing each individual construction project. Key competencies are the development and production of innovative formwork and scaffolding systems as well as engineering services for customized project solutions. Furthermore, for the optimisation of all formwork and scaffolding processes, the range of services includes a number of other technical, logistical and commercial services. Volatile markets, individual customer needs and the continuously high competitive pressure require a highly performing and extremely fast organization which allows for the flow of materials and information at maximum speed. 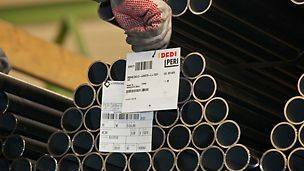 It is the core task of PERI’s Supply Chain Management to enable this flow of materials and information for the benefit of our customers. In order to implement this, strategic, planning and executing processes within SCM are constantly being synchronized.